Since starting VUX World in February 2018, things in the voice assistant industry have changed. 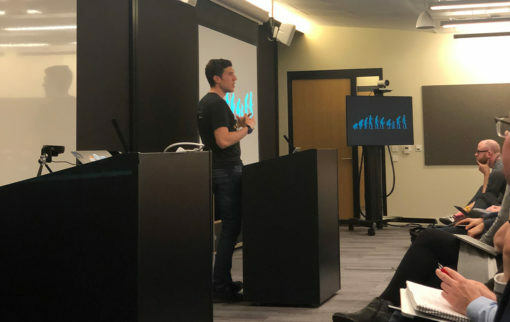 At the last MUXL London Meet-up, Design for Voice, I presented 4 things that have moved forward and gave 4 pointers for you to take into consideration when working on your voice strategy and voice first projects. 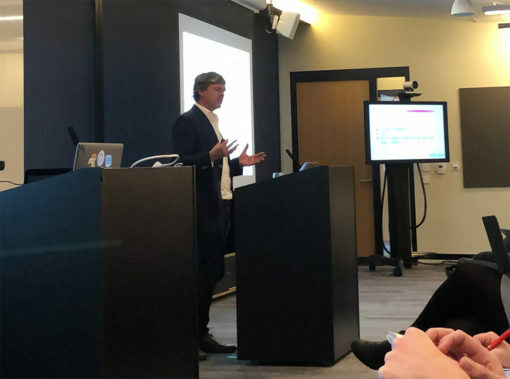 Rewind 12 months and when I was hosting events like the Smart Voice Summit London, I’d ask the audience ‘who’s launched a voice app?’ And ‘who’s working on something but not launched yet?’ About 10-20% of people would raise their hands. This year, it’s nearly half the room. When you first get started in building for Alexa, for example, you’ll likely start with a simple quiz or random fact skill. It’s clear that the experience of the community is beyond that now. Charlie Cadbury, CEO of Say It Now, spoke at the Meet-up about his experience in building voice applications over the last 3 years in the hospitality and travel industry, as well as in retail. He gave examples of the work he’s done and it all has one thing in common: it’s all based on value. There’s no gimmicks. No fart skills. Now is time to start creating things that matter. Things that make a difference. Things that provide genuine value. We don’t need any more cat facts. Smart speakers are selling quicker than smartphones ever did and they’re being used by everybody from kids to the elderly. It’s not just ‘millennials’. We’re also seeing voice assistants becoming available in different locations and contexts. Amazon is reported to be announcing some Alexa-enabled headphones, Apple launched the new Air Pods, Amazon’s Echo Auto is for in-car use and Samsung have committed to shipping Bixby in all of its devices by 2020 (500m per year). Hat-tip Carlie Cadbury for the source. That means that when we’re creating voice apps, we can be targeted in their intended use. We can define the user specifically, we can plan for specific contexts and behaviours. Faisal Valli of Accenture spoke about working on a platform that helps connect older adults to each other and their families. The platform made great use of the Echo Show and had some really cute design tweaks, but the most important thing is that it serves a specific purpose for a specific user in a specific context. There’s no excuse for generic stuff for generic people any more. That doesn’t work in any industry. The more targeted you are, and the more you can marry context and usefulness, the more successful you’ll be. Greg Hedges, VP Emerging Experiences at RAIN agency, told us on the VUX World podcast (out soon) that, 12 months ago, brands were approaching voice in a tactical way. Now, the approach is more strategic. Welcome to Dominos. To order a pizza, please visit dominos.co.uk/alexa to link you account. Needless to say, that by the time you’ve added your order to your favourites box on the website, you might as well click pay now and just order it there and then. Dominos’ application of voice was tactical. It was a marketing ploy that allowed them to say that they’re an early adopter of voice. It gave them a tick in the marketing box. It wasn’t strategic. Virgin Trains’ skill: that’s strategic. It allows customers to order and pay for a train ticket on Alexa. It links to the core ticketing system and takes the booking time down from 7 minutes online to 2 minutes via voice. 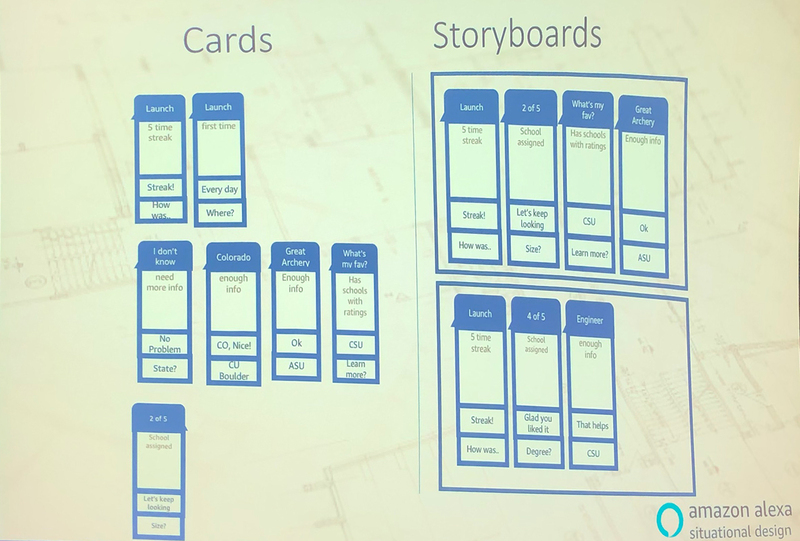 Kristina Csanaky of Voxly Digital shared a case study of how they created the Joe Wicks Body Coach Alexa skill. It was a strategic move for Joe Wicks to engage his audience on Alexa by providing specific content created specifically for smart speakers. Great to be @AmazonUK last night for #voice content creation case studies. Grateful thanks to @mobileUXLondon @kanesimms @Krisztie @CharlesCadbury @FaisalValli9 @muttonia @albertcreixell The best slide? We’re past tactical marketing efforts. We’re in the realms of voice as a strategic play that can move the business forwards. That’s how you should be advising your clients. Over the past year, we’ve spoken at length to many of the top voice designers the world has to offer. We’ve tracked the maturity of the VUI design discipline and things have come a long way. When people first start designing for voice, you can’t help but use a process map or decision tree to map out your experience. What that means is that you’re creating little rabbit holes that users can’t get out of if they decide they want something different. For example, as fantastic as the Virgin Trains skill is, it uses a tree-based structure. If I start out asking for train times, I’m taken down the train time route that gives me times for whichever journey I choose. If I then say “book it”, the skill freaks out. It won’t let me make a booking from within the ‘train time’ branch. I have to go back up to the main menu and back down the ‘booking’ branch to make the booking. Allowing users to hop from any part of the experience to any other part of the experience is called Situational Design. It was coined by Alexa Evangelist, Paul Cutsinger. 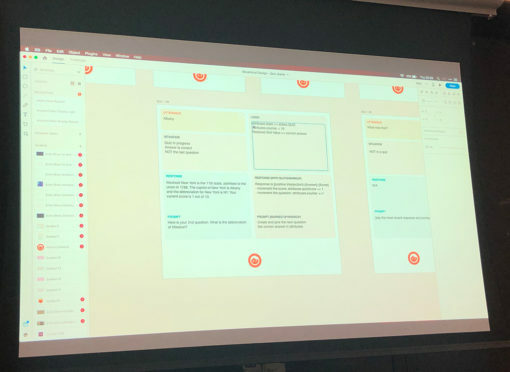 Andrea Muttoni presented the concept at the MUXL Design for Voice Meet-up and shared some templates using Adobe XD. Don’t just assume that a tree structure works. If you’re moving into voice from a GUI background, do you research into the best practice first, don’t just jump right in. The community has moved on and we’ve advanced the design practice, so use the tools that are available to create something better. And check out voiceprinciples.com for a full list of all voice design guides. It’s clear that we’ve moved on. And we’ll continue to move on, as long as we can all collectively step-up our game. Your client won’t do it for you. It’s on you to use your experience, use the community, guide your client in the right strategic direction and create things that matter. I can’t wait to see what heights we reach over next 12 months and look forward to seeing what you create. Next reading Invocable shuts down for good, but why?